Home > News > New Product > Attack on Titan manga “season” box sets—coming in 2018! Attack on Titan manga “season” box sets—coming in 2018! 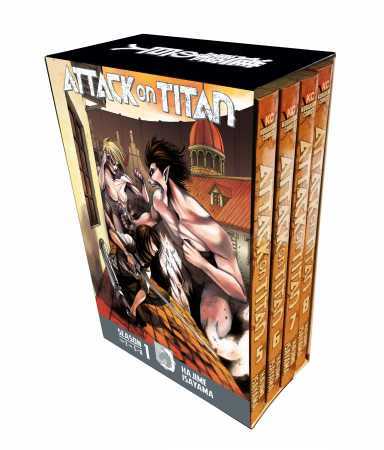 Attack on Titan manga box sets! Are you ready for Attack on Titan? 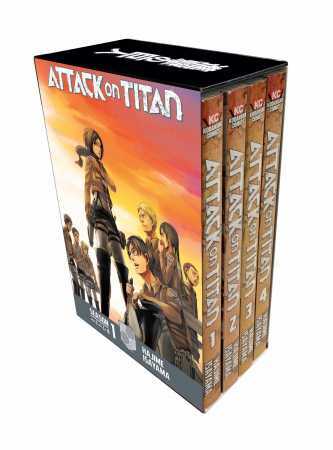 Begin reading the manga that became the megahit anime with this collectible four-volume box set! These four volumes roughly correspond to the first 13 episodes of the anime, the first half of season 1. Also includes two EXCLUSIVE sticker sheets featuring your favorite characters! Continue your journey outside the walls with the manga that inspired the second half of season 1 of the hit anime Attack on Titan! Includes Vols. 5-8. Also includes two EXCLUSIVE sticker sheets featuring your favorite characters! After helping the Garrison to victory, retaking Trost District from the Titans, Eren awakens in a prison cell. He may be a hero to the common people, but among the leaders of humanity, fear of Eren’s mysterious powers threatens his continued survival. It’s only the insistence of the tenacious and pragmatic Erwin Smith, leader of the Survey Corps, that wins Eren a chance: Prove himself outside the Walls, and bring the evidence from his family home back from Titan territory, and the rest of the military will let him live. 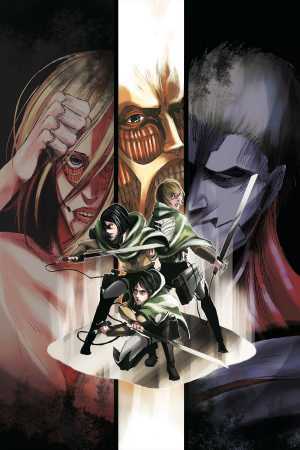 Terrifying revelations, desperate struggles, and broken friendships relentlessly buffet the Survey Corps soldiers as the Attack on Titan manga enters a new chapter, corresponding to the second season of the anime! Box set includes Vols. 9-12, plus an EXCLUSIVE colossal reversible poster!